Looks like this is escalating - what a mess! How, it was asked, was Atwal even admitted to India, given his record ? I thought postmedia was close to going bankrupct or was that only the National Post. Some organization needs to put them out of their misery as they are borderline Fox News. Can you believe they print this garbage! I thought postmedia was close to going bankrupct or was that only the National Post. Some organization needs to put them out of their misery as they are borderline Fox News. It was not that long ago the National Post, the Fraser Institute, etc were considered the right-wing lunatic fringe. WTF is happening to our country! The Bloc Québécois, the sovereigntist party that once formed Canada's Official Opposition, is in crisis mode after seven of its 10 MPs quit. ​The party made the announcement after a caucus meeting in Ottawa on Wednesday morning, pointing to party head Martine Ouellet's leadership style as their reason for leaving. A statement from the party said the seven will form a separate parliamentary group. 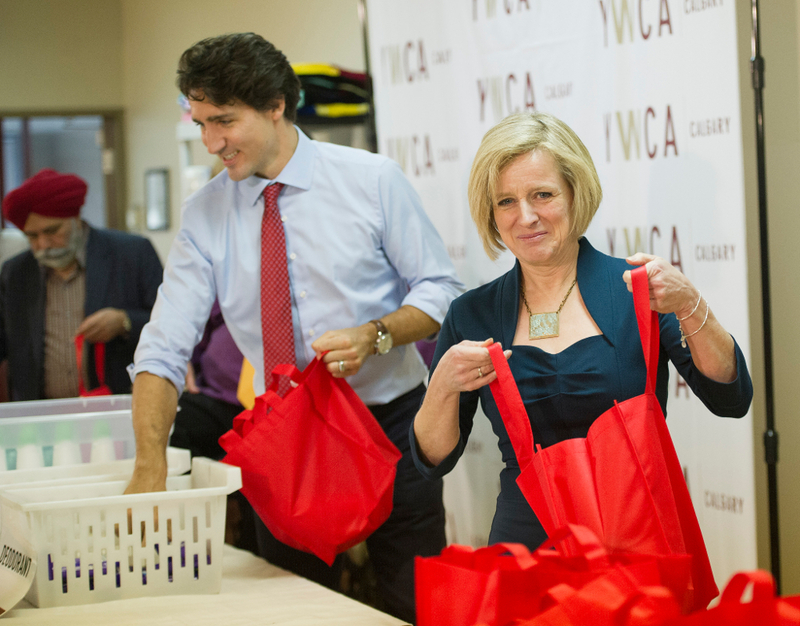 The NDP ought to be able to capitalize on this. We'll find out soon enough - there's a vacant seat in Chicoutimi-Le Fjord, which the Liberals won in 2015 with only a 600 vote margin over the NDP incumbent. If not, there are going to be some hard questions asked. Or perhaps it's a good day for QS. Not trying to reignite any sovereignty/federalism feuds, but if sovereignty is important to you, and if the seven former Bloc don't coalesce into anything appealing, QS might be the way to go. The recent federal budget had feminist framing but few framers who are actually women. Will Budget’s $170 Million End Water Crisis in Indigenous Communities? Decades of delay in providing safe water raise doubts about Liberal promise. But don't concern yourself, Trudeau has a nice self photo-op planned somewhere soon. Canadian regulators stick with less stringent regulations despite growing risks from mega-fracking. British Columbians need to let Liberals know their petro-passion will cost them critical seats in next year’s election. Something is not working. Looks like Trudeau needs a shakeup in his inner advisory group. King Philippe and Queen Mathilde were told in advance of U.S. tariff concerns that Trudeau would likely be unavailable to meet with them. Pipeline politicians’ promises of riches rest on one Kinder Morgan consultant’s report challenged by critics. When Justin Trudeau and Rachel Notley defend the Trans Mountain pipeline, they rely on Kinder Morgan’s suspect numbers. Photo from trumpvstrudeau, Creative Commons licensed. This does indeed appear to be taxpayer's money! Many Canadian Sikhs are fed up with the way their community has been tarnished in the mainstream media ever since Justin Trudeau visited India last month. Writing on the Canadaland website, Jaskaran Sandhu of the World Sikh Organization stated that more than 150 articles have appeared on major news websites focusing on Sikh radicalism and extremism. "It is as if journalists and self-proclaimed Sikh 'experts' who pontificate about alleged radicalism in the Sikh community are stuck in a time warp," Sandhu wrote. "The one-dimensional story of the Canadian Sikh, with a predictable Ujjal Dosanjh quote sprinkled in, is just too easy and tempting." But unlike in the 1980s, when Sikhs didn't respond in the mainstream media in any significant way, this time there's been a vigorous reaction from well-educated younger members of the community. Normally, the name of a photographer who takes pictures for a news story is not important. But in this instance—with even a hint that the Indian government or rogue elements within it were trying to undermine the Canadian government—it takes on special significance. The identity of this anonymous shutterbug could unlock a key aspect of this mystery. Judging from the Liberals' fall in the polls, this story has the potential to influence the outcome of the next Canadian election. That, in turn, could have an impact on how the Canadian government addresses a range of crucial issues, including climate change, in the years to come. I have a hunch that the Prime Minister's Office knows who took the photo. That's because Sophie Grégoire Trudeau would be closely monitored by Canadian security officials at any overseas event. At the same time, intelligence officials can't just spy on journalists willy-nilly, given the constitutional protection accorded the media under the Canadian Charter of Rights and Freedoms. Montreal police recently found themselves mired in scandal for snooping on reporters, which was one of several factors leading to the replacement of the police chief. If Canadian security officials were tracking who was feeding information to Canadian journalists, this would open up a whole new can of worms for the government. Jean won't testify to explain how he came to the conclusion that the Indian government or elements within it wanted to smear Trudeau. And CBC won't reveal how it received the photo or who took it. Meanwhile, a significant portion of the Sikh community in Canada feels that once again, it's being tarnished by the Indian government. Former CBC News executive editor Esther Enkin is the CBC Ombudsman who deals with complaints from the public. There is a way out of this maze for those, like me, who wonder who snapped the image of Atwal with Sophie Grégoire Trudeau and who shared it with the media. And it might not require the appearance of the national security adviser before a House committee. CBC Journalistic Standards and Practices offers clear language around the protection of sources and granting confidentiality. Does the withholding of the photographer's name meet the public broadcaster's criteria in this regard? Our ability to protect sources allows people with important information to come forward and expose matters of public interest. If we do not properly protect our confidential sources, potential sources will not trust us. This compromises our ability to expose abuses of power. We offer protection to sources based on such factors as: the potential impact and importance of the information on the lives of Canadians and its potential influence on public policy. We also consider the extent of personal or professional hardship and possible danger the source may face if his/her identity becomes known. We must make every effort to establish the source’s credibility and find means to corroborate the information. Once we have undertaken to protect a source, we ensure no details that could lead to identification are used on air. We are careful in the use of research material. We use the best technical tools to hide an identity for broadcast. Whenever anonymity is granted, both the journalist and the source must be fully aware that this commitment extends to CBC as well, and is not merely limited to the journalist granting it. There may be legal implications in granting protection. Journalists should be familiar with relevant regulation or seek legal guidance. Before a confidential source is used in a story or a story is published based on the information provided, the managing editor must be told who the source is, and what the agreement entails. Disclosure of sources within the journalistic line of responsibility should not be confused with public disclosure of sources. Seniority of required approvals will depend upon the scope and scale of the story and its potential impact on people or institutions. 1. We also consider the extent of personal or professional hardship and possible danger the source may face if his/her identity becomes known. 2. Before a confidential source is used in a story or a story is published based on the information provided, the managing editor must be told who the source is, and what the agreement entails. 3. Seniority of required approvals will depend upon the scope and scale of the story and its potential impact on people or institutions. It's open to anyone to file a complaint to CBC Ombudsman Esther Enkin if they don't feel that CBC was justified in withholding the name of the photographer. As a former executive editor of CBC News, Enkin is as familiar as anyone with CBC Journalistic Standards and Practices. All anyone has to do is drop her a line and ask if CBC News staff and managers fulfilled their obligations under the rules in granting anonymity to whoever took the photo of Atwal. 1. Did CBC consider the extent of personal or professional hardship and possible danger to the source when the photographer was granted confidentiality? 2. Was the managing editor informed of the source's identity? 3. Did senior CBC officials consider the scope and scale of the story and its potential impact on institutions? 4. And if these rules were broken, will she recommend that CBC News add a proper photo credit to its online story so the Canadian public can learn the identity of the photographer? It shouldn't be too difficult for Enkin to conduct such an investigation. And if she does her work diligently, she might even deliver an answer before voters go to the polls in the next federal election. Lej Sherst commented on Bill Bell's post: "Facebook is the one forum that isn't part of the network of media that donates big time to the Liberal Party (both provincially and federall..."
Lej Sherst shared a link. Just goes, again, to prove you can't trust our media in Canada any longer. It wouldn't be a stretch to say that Cambridge Analytica got their nose into Facebook to try to discourage Canadians from getting together, sharing REAL news, not just the Liberal owned media in Canada. 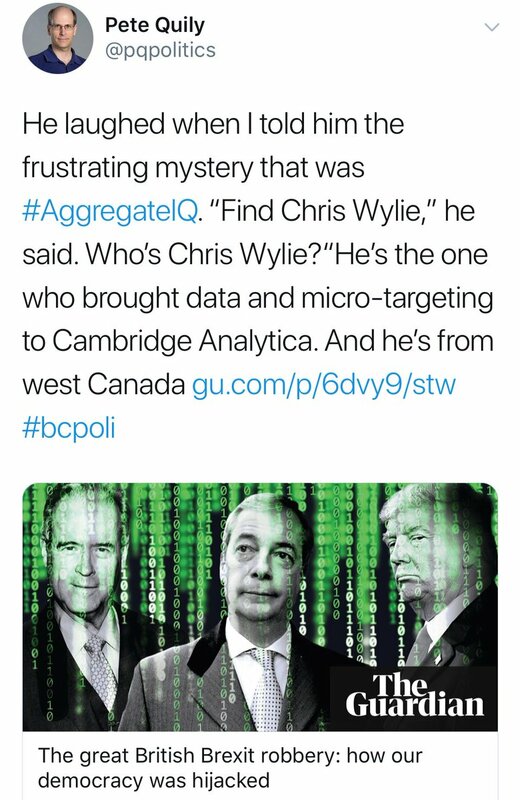 So... the, uh, “Whistleblower” Chris Wylie was actually Aggregate IQ? Awkward. This doesn't look good at all! More gobbeldygook from the Liberals.